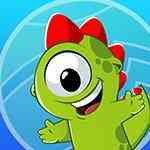 Run with your cute cyclops dinosaur through doze of fun and challenging levels. Avoid monsters and walls while collecting gems. Teleport through unbreakable obstacles and hover in low gravity. And use awesome power ups. Love it so much It will definitely let u addicted to it. Awesome game Nice graphics, easy controls , entertaining and sometimes challenging ! !